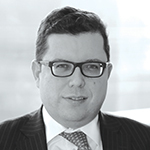 Pedro Moura, Head of Risk Managed Investment Solutions, Schroders. 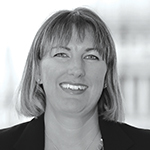 Claire Glennon, UK Institutional Business Development Directors, Schroders. Many funds have benefitted from rising equity markets and feel that now is the time to protect1 these gains. This article discusses accessible techniques for funds to manage the cost and effectiveness of equity protection using options. Funds can insure against potential losses on equities through the use of put options. By combining a traditional equity investment with some insurance (a put option) a fund can limit the amount they could lose on their equities from now to a specific future date. The put option will offset losses on the equity portfolio below the strike level – the level at which the insurance is set. The fund must pay a premium for this; the fund will participate in the potential equity gains less the premium paid and the value of their combined portfolio will not fall below the strike level less the premium paid. For example, if we assume that the strike level is the same as the market level at the inception of the strategy (i.e. £100) and the cost of the insurance (put option) was £4, then at expiry the fund’s maximum loss is £4 (or a minimum value of £96) if the market falls below £100. Beyond that point the value of the option will offset the losses from the market falling below the strike level. However, if the equity market has risen beyond £100 at expiry of the option then the fund will receive the returns on the equity portfolio less the premium it paid for the option (e.g. if equity markets rise to £104 then the fund will have a portfolio worth £104 less the premium of £4, so worth £100). Equity protection – effective but isn’t it costly? The purchase price of this insurance is driven primarily by the expected riskiness of equities. Logically, the riskier and therefore more volatile equities are perceived to be, the more likely the protection will be needed, so (all else held equal) the higher the cost of insurance. However, with the benefit of hindsight we can combine the actual riskiness (or realised volatility) of equities during the life of the option with its value at expiry to calculate the “hindsight value” of the option. Historically the cost of protection tends to be greater than if the actual volatility had been known in advance. This isn’t a statement about whether the insurance will be needed (and option pay-outs are received) rather whether protection through options is priced “fairly”. Figure 1 shows the historic difference between the hindsight value and the price paid. It shows that on average the purchase cost is greater than the hindsight value. In addition the cost varies wildly over time. Funds face the prospect of not only buying protection that in hindsight appears expensive but also face uncertainty over the renewal cost. Independent of this observation a fund may benefit enormously from protection in years with large equity falls. In addition, the cost of protection can vary wildly over time. Funds face the prospect of not only buying protection that in hindsight appears expensive but also face uncertainty over the renewal cost. Source: Schroders, Bloomberg, Bank of America Merrill Lynch. Monthly data from 31 December 2005 to 31 January 2018. Options are 12-month options struck at 90% on the MSCI World Net Total Return Index. Average purchase cost is estimated using Black-Scholes based on implied volatility. Average hindsight value is estimated as the larger of the pay-out received or the theoretical value of holding protection over the year using Black-Scholes based on the forward 1 year realised volatility. Funds can manage the cost of a protection strategy by financing the purchase of put options through the sale of call options. This exchanges uncertain potential equity gains for the certain receipt of a premium payment and is known as a collar strategy. For protection over a single period, the put option is financed by selling a call option with the same expiry, and with the strike level set to achieve a zero net premium cost. There are two issues to consider. (1) The strategy will forego returns beyond a certain level which, in a rising market, can result in the “cost” of differential return, (2) At outset, the maximum percentage loss is usually larger than the potential percentage participation in equity gains. This is because protection through puts is generally more expensive than upside participation through calls. This can be offset to some extent by selling shorter dated options; these lose value through time at a faster rate than the longer dated options that are purchased. Historically, protection against losses greater than 10% over one year can be financed by selling the potential for equity gains beyond 103% each month2. Purchasing a single put option is effective for investors who are concerned about potential equity losses at the option’s maturity date. However, the benefit that this protection provides can be highly dependent on market conditions at just two points in time – when the option is bought and when it expires. This is called path dependency because the outcome is highly dependent on the specific path of the market between the two dates. One way to mitigate path dependency is to split a single (say) 12-month put option into a series of twelve overlapping 12-month put options which expire at monthly intervals. Every month, one option will expire and a new option is purchased protecting against a 10% fall from the prevailing market level. The overlapping nature means that each option (and therefore date selection) is only responsible for a fraction of the protection and path dependency can be dramatically reduced. Even over 16 years, the average annual return of the S&P 500 with a 12-month put option (rolled annually) is highly dependent on the option start date. For example see the difference in returns between an August and October expiry in Figure 3. Source: Schroder. For illustration only. Based on daily data for the period between 1 January 2000 and 30 June 2016. Overlapping option strategies have two distinct benefits. Firstly, the protection level is now the average of the twelve option strike levels, one of which is re-struck each month, which creates a protection level that reflects equity market changes. This not only self-refreshes as the market moves (albeit at a slower rate) but is also evergreen and perpetual. Consider a put option at 90% which protects a £100 portfolio against a 10% drop at outset; if the portfolio rises to £110, the put will only provide protection against a drop in excess of 18%. The use of overlapping put options each with protection set relative to the market level at different dates means that as options expire and are replaced the protection level gradually adjusts and remains closer to protecting against a 10% fall in markets. The second advantage is that by having no specific end date the strategy is naturally evergreen and can be held over the long term (better mapping into funds’ investment horizons) while its systematic fashion offers a low governance approach. 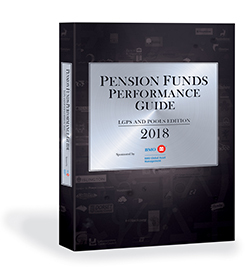 All pension funds need their assets to do two jobs: delivering excess returns to meet funding level aspirations and matching liabilities to control funding risk. The combination of equity exposure with a protection level creates a strategy with a maximum level of loss and can therefore help funds to meet these two aspirations. If the equity exposure employs synthetic assets3, and downside protection is provided through options, investors can achieve (say) £100 of risk-managed equity exposure whilst committing less than £100 of assets. This is possible because the maximum loss is known. As long as this amount is available as collateral there will always be sufficient assets to meet these losses and capital that is not at risk can be reallocated to other strategies – e.g. delivering liability matching. Figure 4 shows how a clearly defined maximum loss (minimum strategy value) can free up excess capital to be deployed in other strategies. Marketing material for professional investors and advisers only. Not suitable for retail clients. The views and opinions contained herein are those of the Portfolio Solutions team, and may not necessarily represent views expressed or reflected in other Schroders communications, strategies or funds. This document is intended to be for information purposes only and it is not intended as promotional material in any respect. The material is not intended as an offer or solicitation for the purchase or sale of any financial instrument. Schroders has expressed its own views and opinions in this document and these may change. The material is not intended to provide, and should not be relied on for, accounting, legal or tax advice, or investment recommendations. Information herein is believed to be reliable but Schroder Investment Management Ltd (Schroders) does not warrant its completeness or accuracy. The data has been sourced by Schroders and should be independently verified before further publication or use. No responsibility can be accepted for error of fact or opinion. This does not exclude or restrict any duty or liability that Schroders has to its customers under the Financial Services and Markets Act 2000 (as amended from time to time) or any other regulatory system. Reliance should not be placed on the views and information in the document when taking individual investment and/or strategic decisions. The aim of the strategies described in this document is to provide a smoother growth path. While this is expected to result in a lower level of risk, long term expected returns can also be lowered than those of a non-risk managed exposure. Issued in March 2018 by Schroder Investment Management Limited, 31 Gresham Street, London EC2V 7QA. Registration No 1893220 England. Authorised and regulated by the Financial Conduct Authority.SCH43326. 1. The strike level: the market price at which the holder of an option can buy (in the case of a call) or sell (in the case of a put) the equity holding when the option is exercised. 2. Schroders. This is a long term average based on historic data on the S&P 500 Index from 31 December 2009 to 31 December 2017. In principle an investor could therefore participate in up to ~3% equity gains every month for 12 months although given the way equity markets move this is unlikely to occur. 3. The most common methods Funds use to access equities synthetically include equity futures, total return swaps and options.